Enjoy the best of SEA LIFE Aquarium and LEGOLAND with SEA LIFE Melbourne Aquarium & Legoland Discovery Centre Tickets. Take the kids to enjoy SEA LIFE Melbourne Aquarium - conveniently located in a central CBD position on the banks of the Yarra River and easily accessed via public transport, the aquarium is home to a dizzying array of marine life species spread out over 12 different zones each following a different theme. The ideal indoor Melbourne attraction for rainy days, Melbourne Aquarium blends observational opportunities with a number of talks and presentations, while also allowing visitors and children to go hands-on via touch pools, kids learning activities, and more. 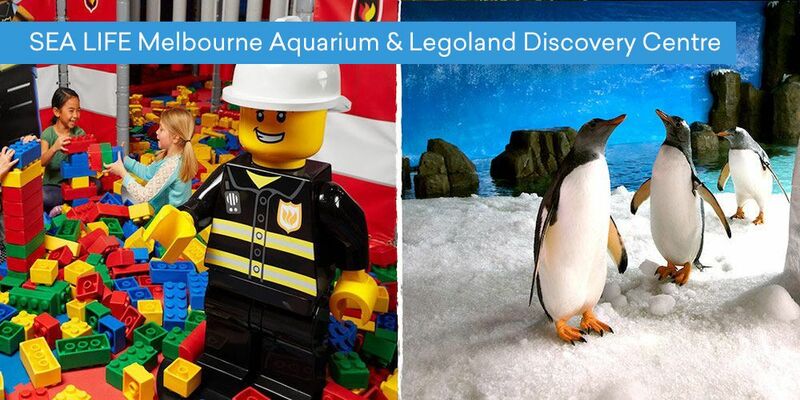 When you've finished up an amazing and informative experience at SEA LIFE, take the kids to one of the newest adventure destination to Melbourne - LEGOLAND. Your kids can step into the world of LEGOLAND and explore the exciting LEGO-themed rides, the replicas of local and global landmarks made out of millions of LEGO bricks in MINILAND, the 5 LEGO build and play areas, as well as a 4D cinema. It will truly make any birthday celebration, or a simple afternoon, exceptional! Don't miss out on a 2-for-1 package deal that give you and the family access to Melbourne's favourite family destinations. Book today!